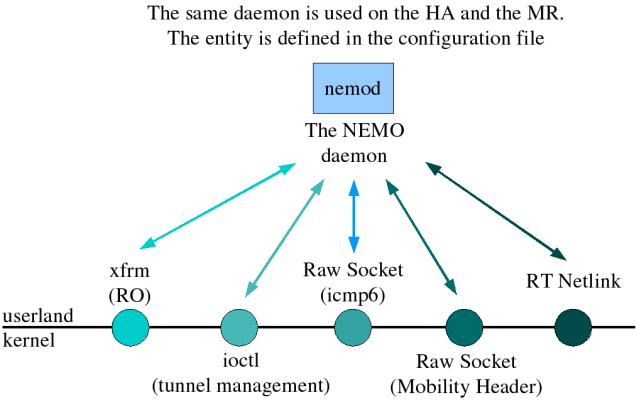 This document aims at helping the reader to build step-by-step a NEMO test network on Linux. We first introduce the basic concepts of IPv6, host and network mobility. We also briefly present NEPL (NEMO Platform for Linux). We then explain how to properly configure a simple test network, with a NEMO-enabled Home Agent and Mobile Router using NEPL. Updated the NEPL patch (version 20090624). It fixes routing problems when returning home. Updated the MCoA patch (version 20090624). It does not include new features, but can be applied above the updated NEPL patch. Updated documentation to use a 2.6.29 kernel. As a result, no patches are needed for the kernel anymore. Note: Older patch and software releases are available here. A complete changelog is available at the end of this page. In today's Internet, most communications between end-to-end nodes are using the IP protocol. This protocol assigns an unique address to all nodes connected to the Internet, and provides the mechanisms to transport data between two nodes. IP version 4 (known as IPv4) is the current version of this protocol and was the first widely deployed IP protocol. It was standardized 25 years ago. It is now suffering from several design problems and will certainly restrain the creation of new usages of the Internet. The most debated problem with IPv4 is the lack of addresses, but it is not the only important one. The need for addresses will increase in the near future. With the voice-over-IP becoming more and more popular, we can guess than billions of people will use an IP phone. Each vehicle will embed tens of IP sensors and some multimedia devices. Obviously, all of those equipments need an IP address. The lack of addresses that can be assigned with IPv4 was solved with the Network Address Translation (NAT) system. However, many peer-to-peer applications (such as video-conference or voice-over-IP softwares) suffer from this mechanism: with NAT, the real address of the host is not directly reachable from its correspondent. The communication cannot be directly established and sometimes need a third part. We expect more and more equipments will be connected to the Internet, but the IPv4 protocol is not appropriate anymore to distribute and manage the IP addresses. The IPv4 scheme to allocate addresses is not based on any hierarchical scheme and the high fragmentation of address space will lead to an heavy load on backbone equipments (the routers). This is one of the most critical problems with the current IP protocol as it might cause the core routers of the Internet to stop working without prior notice. Eventually, the IPv4 protocol has a monolithic design that makes it difficult to extend, and contains some mechanisms that prevent new protocols like mobile IP to work flawlessly. As IPv4 cannot meet the demand anymore, the IPv6 protocol (RFC 2460) has been standardized in 1998. It can allocate much more addresses and allows to interconnect undecillions (10e36) of nodes at the same time. Nodes that connect to the Internet can automatically acquire an address thanks to the auto-configuration mechanism (RFC2462 "IPv6 Stateless Address Autoconfiguration"). IPv6 also simplifies the use of multicast, that allows many to many (including one to many) communications without wasting the bandwidth. Besides those core features, IPv6 also allows the integration of new features such as improved security, quality of service where IPv4 only provides best effort, and mobility mechanisms with Mobile IPv6 and NEMO Basic Support. The scalability offered by IPv6 will thus allow to interconnect any equipment and to design new services (such as connecting each car to the Internet) and new usages of the Internet (for instance use the vehicle connectivity for monitoring purposes) that we could not imagine with IPv4. When a node using an Internet wireless access physically moves, it can be at some point of time out of the coverage area of its access network and needs to move to another one. In addition, because distinct operators may operate or the public target is different (pedestrians, cars etc. ), usually no single access technology can cover one big area (such as a city). The node thus has to select the best access technology available. When a node moves from one access network to another or switches between its access technologies, it acquires a new IPv6 address and is not reachable to its previous one anymore. It implies that all current communications (for example streaming video from the Internet) are stopped and later restarted by the user or the application. The Mobile IPv6 protocol (RFC 3775) has been defined to address those issues and allow the node to be always reachable at the same IPv6 address whatever the access network it uses. It allows the host to move transparently for the applications and the users, without the need to reset all the current connections each time the host moves to another access network. With Mobile IPv6, a host has two addresses while moving in the Internet topology: one permanent address that identifies the host, and the other representing the location in the Internet topology. The Mobile IPv6 protocol takes care of the binding between these two addresses (thanks to a Home Agent), and ensures that the host is always reachable at its permanent address even if it moves in the Internet topology. On one side Mobile IPv6 manages mobility for only one host, on the other side NEMO Basic Support (RFC 3963) manages mobility for one whole network. Such a network can be for instance a PAN (Personal Area Network, a small network made of IPv6 sensors and PDAs), or an access network deployed in cars, buses or trains. Thanks to NEMO Basic Support, the only computer that needs to have mobility functionnalities when the whole network moves is the one that connects the network to the Internet (this computer is called a Mobile Router), whereas with the Mobile IPv6 approach each host in the network would have to handle mobility. Running Mobile IPv6 on each node can be expensive, especially for little devices such as sensors. NEMO Basic Support only requires changes on the router, all others hosts in the moving network do not need any new feature. Thus all movement in the Internet topology will be handled by the router, transparently to the hosts. With NEMO, we can imagine lots of senarii where mobility can play an important role. Using Network Mobility in a train would allow the customers to stay connected to the Internet without disruption during all their trip. Network Mobility in cars can allow to set up a PAN (Personal Area Network) made of tiny IPv6 sensors that can be queried from outside, and PDAs that can have permanent access to the Internet. RFC3963 "Network Mobility (NEMO) Basic Support Protocol"
RFC3775 "Mobility Support in IPv6"
NEPL (NEMO Platform for Linux) is a freely available NEMO implementation for Linux on 2.6 kernel. The original NEPL release was based on MIPL2 (Mobile IPv6 for Linux) and has been developed and tested in cooperation between the Go-Core Project (Helsinki Univestity of Technology) and the Nautilus6 Project (WIDE). NEPL is now maintained on UMIP, which is an effort from the USAGI people to maintain MIPL2 to the current kernel releases. NEPL currently supports Home Agent and Mobile Router, Implicit and Explicit registration modes and DHAAD. Extensions to NEPL, such as Multiple Care-of Addresses registration, are available in Section 6. Up to two levels of Nested mobility, including Nested Mobile Networks and Visiting Mobile Node in a Nested Mobile Network. NOTE: If you are interested in setting up a virtual platform, you may have a look at uml_clownix_net which provides the necessary tools and documentation to setup a topology modifiable virtual network with UMIP. 2001:a:b:1::/64 to 2001:a:b:f::/64 are the Mobile Network Prefixes that can be registered by the Mobile Routers and announced in the Mobile Networks. This platform can thus handle 15 MNPs. Two Foreign Links FL1 and FL2 interconnected by a Router R.
A Mobile Network connected to the Internet via a Mobile Router MR. The MR can move between the Home Link (HL), FL1 and FL2. Some Mobile Network Nodes (MNNs). You need to recompile a kernel from scratch for your system, here is the procedure for a 2.6.29 kernel. First, Download the kernel sources. Note that your don't need to patch the kernel anymore (support for IPv6 mobility has been integrated since version 2.6.26). If you want to use Multiple Care-of Addresses (MCoA) registration on the Mobile Router, please refer to section 6.b in order to activate some more needed options. Verify your bootloader (LILO or GRUB)'s configuration and reboot on your new kernel. NEPL is an extension to UMIP provided as a patch. UMIP is an effort from the USAGI people to maintain MIPL2 to the current kernel releases. By applying the NEPL patch on UMIP, you will get the NEMO Basic Support extension. The --enable-vt option will enable the virtual terminal, which can be useful to retrieve the binding cache or binding update list information on the Home Agent or the Mobile Router. See section 5 for more information. The Home Agent configuration file will be stored in /etc/mip6d.conf. Here is a sample file for our test network. Read carefully the mip6d.conf manpage to have more information on each keyword. NOTE: even though you do not plan to use the Home Link (e.g. in a Virtual Home Link configuration), you still have to advertise RA with the home link prefix: mip6d needs it to configure its Home Agent list. In that case you can use dummy interfaces to advertise the home link RA. See the FAQ entry for more information on how to configure a virtual Home Link. Once the script is executed, the Home Agent should be operational and ready to register your Mobile Router. The Mobile Router configuration file will be stored in /etc/mip6d.conf. Here is a sample file for our test network. Read carefully the mip6d.conf manpage to have more information on each keyword. # Replace eth1 with the interface connected to the NEMO-Link. # IF1 is the egress interface. Do not configure any address on it. Once the script is executed, the Mobile Router should be operational and ready to register to the Home Agent when moving in foreign networks. # The lower the preference is, the prefered is the interface. In the present case, eth0 will be used when available to send and receive traffic to and from the Mobile Network. If eth0 is disconnected from its link, eth2 will be used instead for the communications. NOTE1: in order to get good performances in vertical handovers between your egress interfaces, be sure that the access routers on your foreign links send frequently Router Advertisements or always reply to Router Solicitations. NOTE2: if you wish to use a cellular interface (GPRS, UMTS, etc.) as one of your network interface, please check the FAQ section. An excellent HowTo to configure IPsec with dynamic keying on UMIP (using racoon2) is available here. This document has been contributed by Sebastien DECUGIS. Once your Home Agent is operational, you can boot the Mobile Router. Once the NEMO dameon is running, be sure that the Mobile Router and the MNNs inside the Mobile Network are reachable (using ping6 for example) when the MR is in the Home Link. If they are not reachable, you certainly have a configuration problem. If all your test network is setup and all nodes are reachable from each network, then you can try to move your Mobile Network from the Home Link to Foreign Link 1, by connecting the Mobile Router's egress interface to FL1. The MR will then register to the Home Agent, and each node (MR and MNNs) will still be reacheable at the same address as if they were in the Home Link. We can see that the CoA 2001:a:c:1:208:dff:feed:beef wich is bound to the HoA 2001:a:b:0:0:0:0:1 is registered to the CN (here, the Home Agent) whose address is 2001:a:b:0:0:0:0:1000. You can now move your Mobile Network from the Home Link to FL1 and FL2, transparently for all the MNNs in your Mobile Network. Multiple Care-of Addresses Registration (MCoA) allows a Mobile Node (Mobile Host or Mobile Router) to register simulteanously multiple Care-of Addresses to its Home Agent. Main benefits, amongst others, are policy routing and fault tolerance for the Mobile Router. The current implementation is based on draft-ietf-monami6-multiplecoa-01.txt. It is shipped as a patch for the UMIP userland that must be applied AFTER the NEPL patch from section 4.b. It runs on a 2.6.29.5 kernel patched with the UMIP kernel patch, and is based on the NEPL for UMIP code. Note that MCoA allows to use multiple interfaces at the same time, whereas the interface preference mechanism explained in section 4.e1 only allows to use multiple interfaces sequentially. The Policy Routing only works for the FORWARDING TRAFFIC. The traffic generated locally on the Mobile Router will not benefit from the Multiple Care-of Addresses registration. However, the traffic from the MNNs can be routed by the Mobile Router according to your policies. We are currently working on this issue to also allow policy routing for the Mobile Router itself. IPsec is not supported. We will work on this part once we get a rather stable implementation. Returning Home or mixing interfaces at home with interfaces in foreign network does not work. We are currently discussing which behaviour on the Mobile Router would be the best when one of its interface returns home. Besides this, there are still some bugs, so any bug report is welcome! In order to fix a problem with the BU that could be sent through a disconnected interface, you need to patch the kernel with this patch (more explanation on the problem here). Compile and reboot on your new kernel, as explained in section 4.b. Download all the necessary softwares and patch: the UMIP userland, the NEPL patch for UMIP, the MCoA patch for UMIP, and an extra patch to solve an issue regarding the interface chosen to send the BU. The --enable-vt option will enable the virtual terminal, which can be useful to retrieve the binding cache or binding update list information on the Home Agent or the Mobile Router. The Home Agent configuration file supports new items to enable MCoA registrations. Please also refer to the mip6d.conf manpage for more information. The radvd.conf and the startup script remains the same as in section 4.d. The Mobile Router configuration file supports new items to enable MCoA registrations. Please also refer to the mip6d.conf manpage for more information. # and MnIfPreference is ignored. # If no external policies are used, the higher is preferred. # a heartbeat. Check the manpage for more details. You should also set DoRouteOptimizationCN, DoRouteOptimizationMN and UseMnHaIPsec to disabled;. MnMaxHaBindingLife should also be set to a small value (thus the HA can quickly delete useless bindings if needed). Using Optimistic Handovers may also give you better results in case the Mobile router redirects flows from one tunnel to another. If one MR-HA path is not very reliable, you can also set the Reliable option to false; in the corresponding Interface entry. Please check the manpage for more information about that. NOTE: if you wish to use a cellular interface (GPRs, UMTS, etc.) as one of your network interface, please check the following howto that will explain you how to setup an IPv6 connectivity over it using OpenVPN: Setup OpenVPN with an UMTS interface on Debian GNU/Linux to get IPv6 connectivity. Once your MN has registered multiple Care-of Addresses to your Home Agent, it can use its multiple MN-HA tunnels for policy routing. The policy routing part is managed with the ip6tables tool. Be sure to install this tool (included in the iptables tool suite) on both your HA and MN. If it is not available as package for your Linux distribution, you can get it on the netfilter.org webpage. You will use the BID that you assigned to each interface to mark the packets. Packets marked with BID X will be routed through the interface whose BID is X. If this interface is not available (because it is down), then the packet will be routed through the most prefered interface (the one with the highest BidPriority). NOTE: At the moment, ONLY PACKETS FORWARDED BY THE MR (ie packets sent by MNN via the MR) can benefit from the policy routing. Packets generated by the MR itself will not be routed according to your rules. We are currently working to improve the current situation to also allow the MR to benefit from the policy routing. Use the ip6tables tool and the MARK target to mark your packets with the BID. Ip6tables rules must be done in the PREROUTING chain, in the mangle table. As you see, one current limitation is that each rules created on the MR must be also created on the Home Agent. We plan to support in the future some policy exchange mechanism between the MR and the HA in order to configure automatically the HA. Read carefully the ip6tables manpage. You will be able to create rules based on many parameters, and thus create a very subtle policy routing on your MR. Some enhancements for NEPL are available on http://software.nautilus6.org/NEPL. This includes Mobile Network Prefix Delegation to delegate automatically the Mobile Network Prefixes to your Mobile Router, and some interfaces preference mechanism. Please note that those features were implemented on a quite old version of NEPL. It is now considered as obsolete, and you should prefer the latest version of NEPL (NEPL for UMIP) available in section 4.b. Note that at the moment there is no plan to port those features to the latest version of NEPL. For any questions or bug report regarding those features, please send a mail on our support mailing list. As those features are not supported by the MIPL2 developers, please do not complain on the MIPL2 mailing list. The Mobile Network Prefix Delegation mechanism, as defined in draft-ietf-nemo-prefix-delegation-00, extends NEMO Basic Support for a Mobile Router to synchronize its Mobile Network Prefixes with its Home Agents and obtain new ones dynamically. NOTE1: with this prefix delegation mechanism, it is not possible for the Mobile Router to boot on Home Link, as the Prefix is delegated only when a Binding Update is sent. Such a mechanism is thus designed for Mobile Router that are never at home. NOTE2: this work is based on a different version of NEPL, which is older than the NEPL version used previously in this document. Prefix Delegation is currently based on NEPL-SE-1.0 which works on a 2.6.11 kernel. Now edit the kernel configuration file, compile the kernel and boot on it as explained in section 4.b. This work is experimental. We invite the reader to check the README.txt file included in the package. It provides useful instructions and information about what is supported and what is not. With this configuration, the Mobile Router will ask the Home Agent to delegate it a /64 persistent prefix, that will be assigned to the eth1 interface. The eth1 interface will automatically configure an MNP::100/64 address (in our example, 2001:a:b:1::100/64). Of course, several prefixes can be asked and assigned to different ingress interfaces. Read the documentation to check how to configure the Home Agent and the Mobile Router in that case. Please read also carefully the README.txt file included in the package for more information. How to configure a Virtual Home Link on the Home Agent? You can now use the dummy0 interface as the Home Link interface. In particular, you have to modify the /etc/radvd.conf, /etc/mip6d.conf and the startup script of the Home Agent to set the Home Link interface to dummy0. How to use point-to-point interfaces with UMIP? It is possible to use cellular interfaces (GPRS, UMTS, etc.) with UMIP, but you need to have an IPv6 connectivity on this interface. One way is to use OpenVPN to provide the IPv6 connectivity over the point-to-point link, and to use a bridge interface as the one to use with UMIP. An excellent documentation contributed by Guillaume SCHREINER is available here: Setup OpenVPN with an UMTS interface on Debian GNU/Linux to get IPv6 connectivity. Another way to get IPv6 connectivity is L2TP. A documentation to setup L2TP is available here: Setup L2TP on GNU/Linux to get IPv6 connectivity. However, there are some known problems when using the L2TP ppp interface with UMIP. You should then apply the following patches to have the correct behaviour: first, apply feat_is_dad_necessary.patch (this avoids to run DAD on PPP links), and then feat_wait_for_lladdr.patch (this allows UMIP to wait for a link-local address to be assigned by the kernel when no hardware address is available on the interface - contributed by Jozsef KOVACS). You will then have to recompile UMIP. How to get my GPRS/UMTS card working on Linux? This is not really related to UMIP, but you may find what you need in this tarball: Configure an UMTS/GPRS card on GNU/Linux OS. RFC2460 "Internet Protocol, Version 6 (IPv6) Specification"
RFC2462 "IPv6 Stateless Address Autoconfiguration"
Setup a CF card with a GNU/Linux OS including NEMO support. Many thanks to the MIPL and UMIP developers who provides support on the MIPL Mailing Lists, people at Strasbourg University (Networks and Protocols team, LSIIT, Strasbourg, France), and people at Telecom-BretagneT (Rennes, France). support(at)ml.nautilus6.org: You can get or provide support for our softwares and documents on this mailing list. Feel free to describe your problems, report bugs, send patches etc. on this mailing list. You can check the archives of this ML here. announce(at)ml.nautilus6.org: All demonstrations, events and softwares in which Nautilus6 is involved are announced on this mailing list. Members of this ML cannot post on it. You can check the archives of this ML here. Any comments to improve this document are welcome! Updated the NEPL patch (version 20090624), which fixes routing problems when in the home network. Added a FAQ entry on how to configure a virtual Home Link with a dummy interface for the Home Agent. Added a FAQ section with some tips for people having troubles using UMIP over PPP interfaces. Patches and documentation update on January 8th. Released new NEPL and MCoA patch (version 20080108). The NEPL patch fixes a registration issue on the HA and improves the IPsec code to protect the traffic from and to the MNP (contributed by Arnaud EBALARD). The MCoA patch is an update to be able to use it on top of the new NEPL patch. Patches update on November 5th. Released new NEPL and MCoA patch (version 20071105). The MCoA patch fixes a bug in MCoA preventing the MR to correctly bind with its Home Agent. The NEPL patch fixes a bug on Big Endian computers and add some NEMO-related debug messages (contributed by Arnaud EBALARD). Small update on October 26th. Released new NEPL and MCoA patch (version 20071026) fixing a bug in the NEMO IPsec code. Version 2.3 released on October 22nd. Updated the NEMO patch to UMIP 0.4. It now supports IPsec Tunnel Payload protection for the traffic from and to the MNNs (Contributed by Sebastien DECUGIS). Updated the MCoA patch to UMIP 0.4. Version 2.2 released on July 16th 2007. Version 2.1 released on June 15th 2007. Version 2.0 released on May 8th 2007. Version 1.9 released on January 18th 2007. Version 1.8 released on January 9th 2007. Solved the problem preventing the MR to work correctly when in the Home Network. Version 1.7 released on June 30th 2006. Version 1.6 released on June 1st 2006. Version 1.5 released on February 28th 2006. Updated to newer userland and kernel (nemo-0.2 and kernel 2.6.15). Version 1.4 released on February 22th 2006. Updated the interface preference section. Version 1.3 released on February 20th 2006. Updated to newer userland (nemo-20060220). This solves serious thread management problem on the HA. Added a link to the Linux CF HowTo (see References). Version 1.2 released on February 17th 2006. Version 1.1 released on February 9th 2006. Version 1.0 created on November 10th 2005.